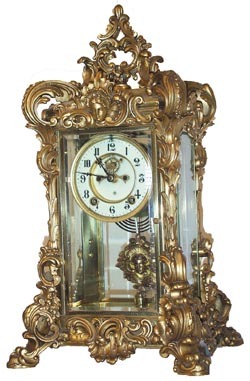 Ansonia Clock Co. Crystal Regulator, "Apex", ca 1905. This is an original gold plated case with about 50 percent of the gold still trying to hold on. It was originally, or at least is now, an antique gold. Most of the case has a Syrian bronze color, which is fine. If it were redone I would probably have suggested Syrian Bronze plating. All 4 beveled glasses are perfect, or appear so without a magnifying glass examination. 8 day movement strikes half hours on a standing gong. 2 piece porcelain dial is near perfect, open escapement with jeweled pallets, correct hands, clock just keeps on running. Outstanding pendulum bob with ladies head embossed on it. This is another of those collectable crystal regulators that we were buying 5-6 years ago for $2000. Ly-Ansonia, page 109.